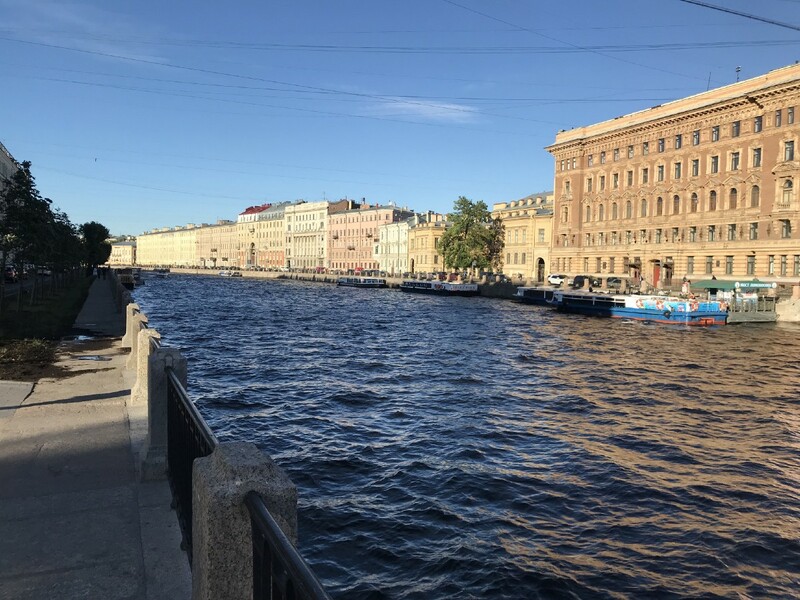 In early summer of 2018 I traveled across Russia on the Trans-Siberian Railway, from St Petersburg to Vladivostok. This is the story of that 2.5-week trip told in several parts, documented for the benefit of myself, friends and family wondering why I disappeared, and anyone considering a similar trip. 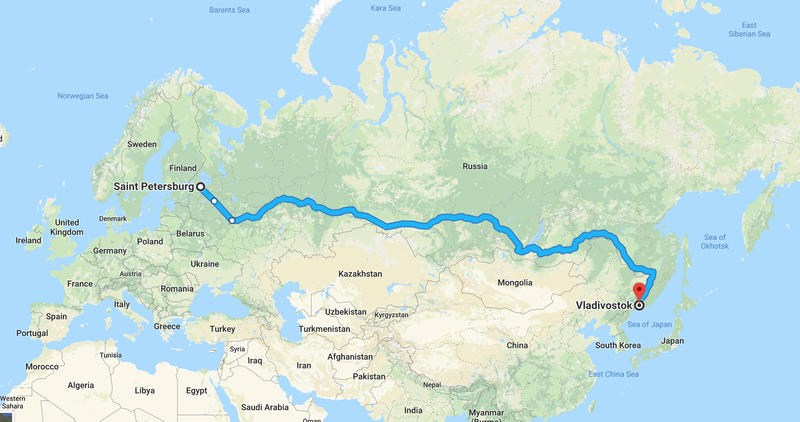 The route of my trip along the Trans-Siberian Railroad, from St Petersburg to Vladivostok. Enough has been written about planning a Trans-Siberian Railway trip, so I’ll skip all that and ask you to trust me that everything was done in an entirely legal and sensible manner. Of all my preparation, the most useful and relevant thing was taking lessons to improve my rusty Russian. Unless otherwise noted, it can be assumed that any conversations with Russians were in their native tongue. The plan—if it can be called that—was for Eugene, my second cousin, to meet me at the airport. I’ve never met Eugene and it didn’t occur to me to ask for a photo. The only information I had was his email address, approximate age (mine), and his one-time profession (professor of philosophy). Upon reaching the welcome area of the arrivals the best I could do was linger until a 30-something academic walks towards me with an outstretched arm. That did not happen. After enough time passed for me to read every name-sign and make awkward eye contact with every man in the terminal, I needed a way to contact Eugene. There were no open WiFi networks, so I walked into a mobile phone store to buy a Russian SIM card. Thankfully, buying a SIM card in Russia is a drawn-out affair that involves lengthy registrations and passport verification, which meant I was in the store long enough to witness a bearded and panicked man rush in with arms flailing and, with his last reserves of breath, ask if he may charge his phone. Before a salesperson finished lying “no, sorry,” the man spun around and lurched out. “That must be Eugene,” I thought. We became acquainted on the ride to St Petersburg—me, Eugene, and Russia. Driving into Saint Petersburg, past Soviet-era monuments and buildings. The historic center resembles Venice. The rotating hostel staff is comprised of all girls. I saw Sasha most often, and thought of her as the “mother” of the staff. She’s in a PhD program for philosophy, is very friendly, and speaks matter-of-factly. Dasha worked the night shift and spoke very little. Galia seemed nice. 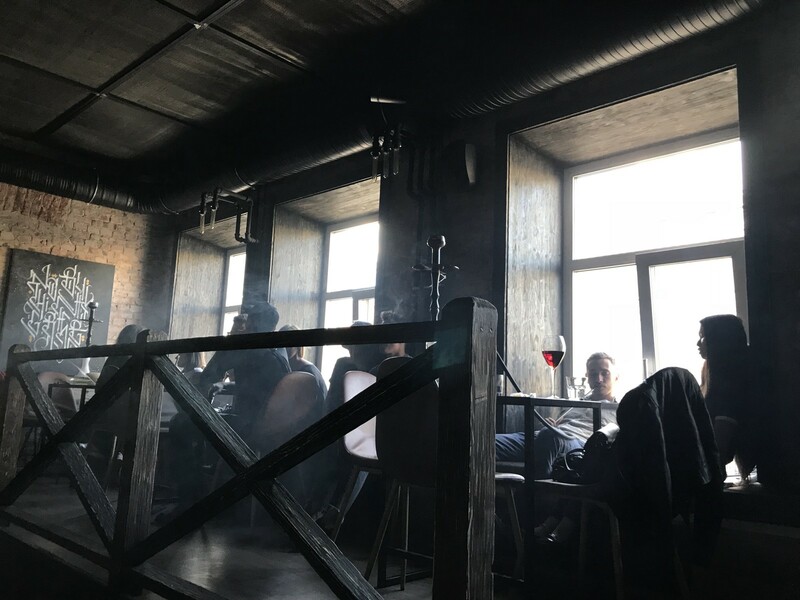 Angelika recommended a nearby Israeli restaurant. Diana was accustomed to flirty Argentinians and Brazilians who gargled out “You’re pretty” in Russian from memory. Despite this being our first meeting, Vlada and Boris gave me a warm welcome with cognac, a home-cooked meal, tea, and wonderful stories. Boris, professor of philosophy, showed me photo albums from their travels. Vlada, my father’s cousin and a professor of fashion design, spoke with lightning energy and in the span of an hour managed to learn all about me, ask about the family back home, catch me up on her life story, determine my inner animal—which I now forgot, though I remember Boris is a crocodile—and arrange a personal tour of the art museum for the next day. Boris and Vlada accompanied me partway back to the hostel. It was past 10pm, but there was a rosy-orange sunset that would remain until morning. 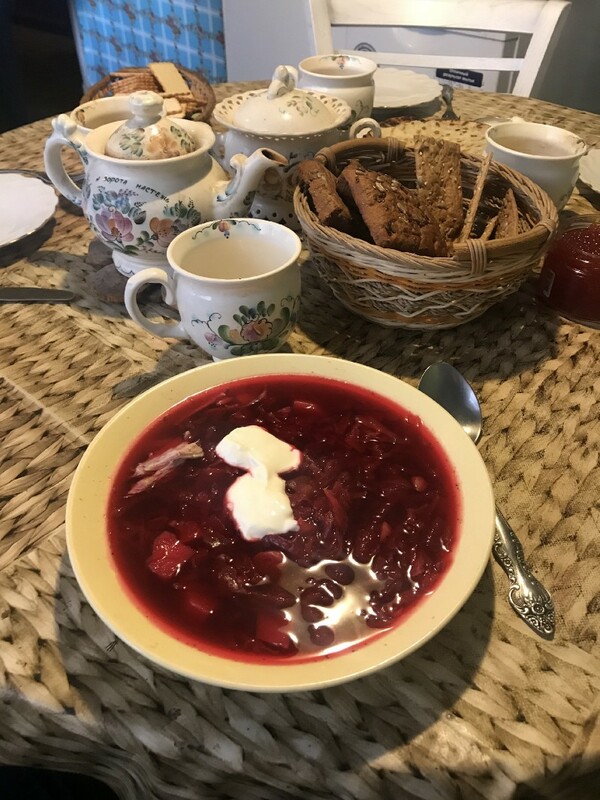 I’m greeted with a homemade Russian meal. Me, Boris, Eugene, and Vlada. 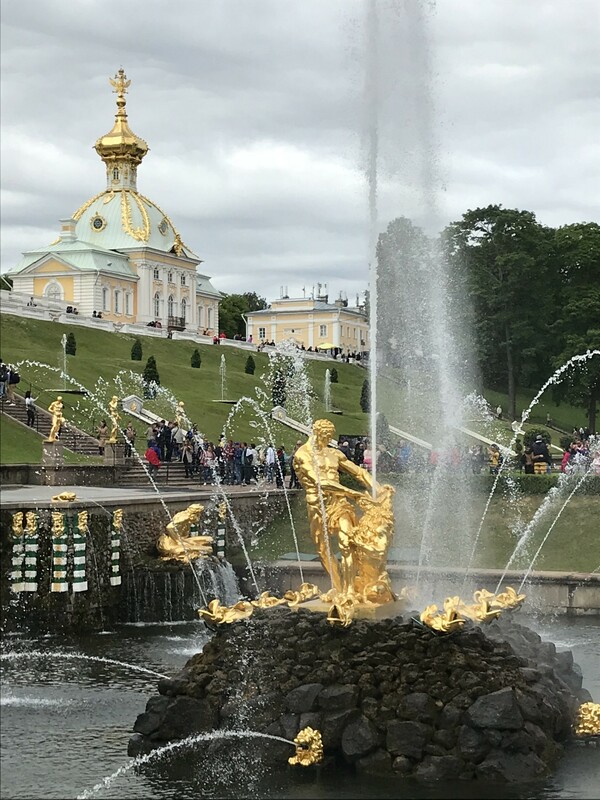 Gilded fountains at the Peterhof Palace. The palace and fountains were fine. When a ginger squirrel climbed onto my leg I accepted that that would be the most interesting thing I’d remember about the place, and turned to leave. 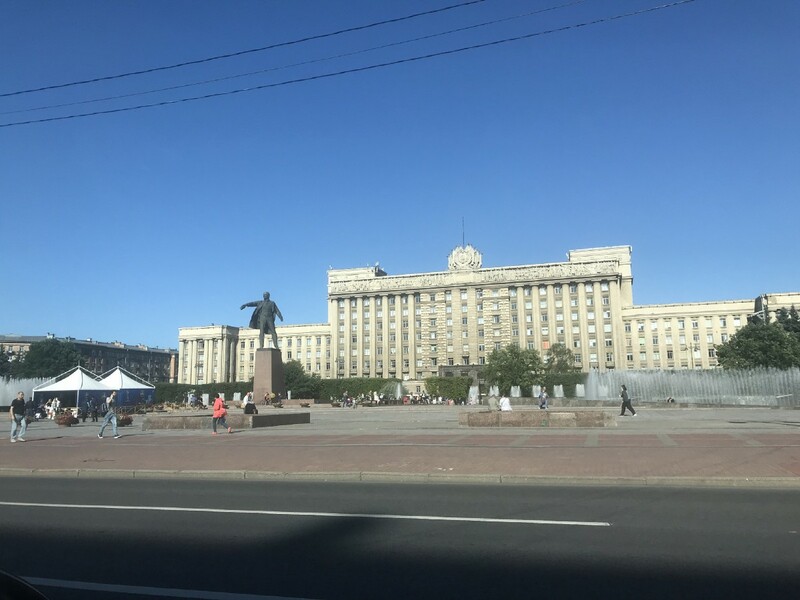 I’ve been to the Romanian city where one of my grandfathers served in the Red Army, and the Ukrainian fort where my father served his compulsory military service. Here I had my chance to visit the military institute where my other grandfather studied before defending St Petersburg—then called Leningrad—as an artillery officer in the Second World War. The institute is in a nondescript building on the north shore of the Neva. There is no visitor center, website, or even a sign. I had no plan besides finding the entrance and seeing what happens. On the way there, however, I noticed the Museum of Artillery. The museum, I thought, would give me better odds of learning about my grandfather’s past and lower odds of arrest. 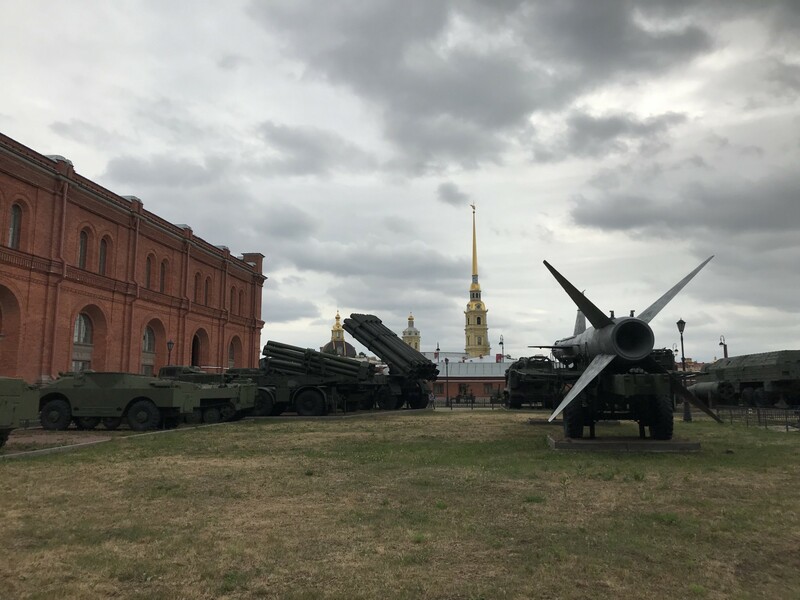 The Museum of Artillery (red) includes an outdoor display of historic and modern Russian artillery. After meandering through the uniformly colored rockets, trucks, and tanks in the interior courtyard, I found a map of the museum’s layout and noticed an area labeled “Archive.” Maybe I can find something about my grandfather there, I thought. 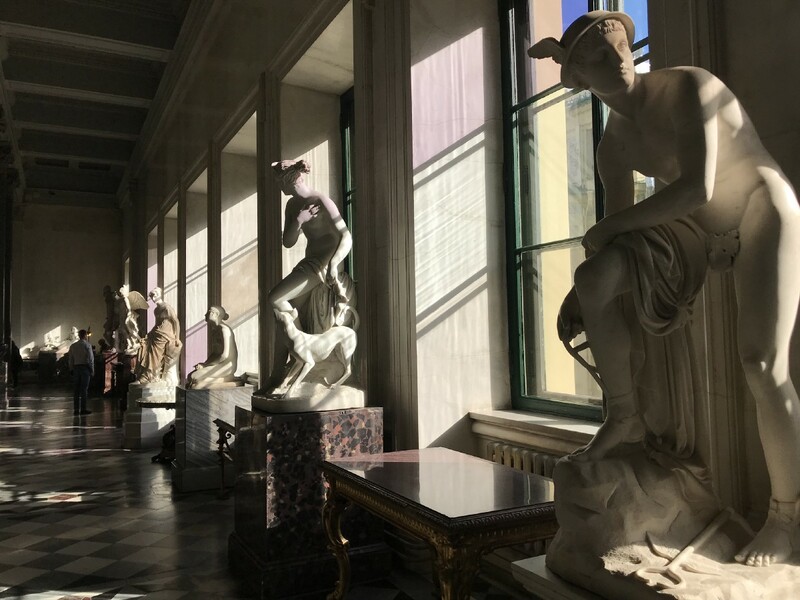 To reach the archive, according to the puzzled staff at the ticket window, I needed to exit the museum, re-enter through an unmarked door at the eastern wing of the building, and proceed to the third floor. The door was almost where they said it would be, and was marked “Staff Only.” On the third floor was a small and unimpressive door, which I pushed open to find a corporate-looking office with employees sitting at their desks, surrounded by bookshelves, printers, and indoor plants. Nobody seemed to notice an American just intruded their workspace. I walked up to the nearest person, who was standing at their desk and reading the contents of a folder. “Excuse me, do you work here?” I asked. The man turned to me, blinked, and considered the question… “Yes,” he said. I grew excited and told him the first and last name. “How about the middle name?” he asked. That’s when I realized how unprepared I was to find information about one person in an army of 30–40 million. Excitement turned to wishful thinking. “Well, hmm… How about his date of birth, or maybe an army division?” he asked. I had these details somewhere on my phone, but I understood that even a person this kind must have limited patience. This required a followup. The State Russian Museum houses an impressive collection of modern art. At Vlada’s invitation we went together so she could give me a personal tour. Vlada meets me for a fashionable tour of the art museum. With a special ID and whispered phrase, Vlada got us past the ticket office and before I knew it we were examining the works of Malevich, Kandinsky, Chagal, and others. Vlada led me to her favorite paintings and shared the history and her views on each one faster than my brain could process it. As soon as an explanation ended, we were off at a hundred miles per hour to the next masterpiece, only slowing down for Vlada to declare some paintings “weak, really weak.” All this action left me in a speechless state that I can only hope looked something like sophisticated study and reflection to an observer. After a nap at the Chickadee Hostel and a dinner at an outdoor Georgian food stall, I returned to the river for a midnight boat ride under the drawbridges. 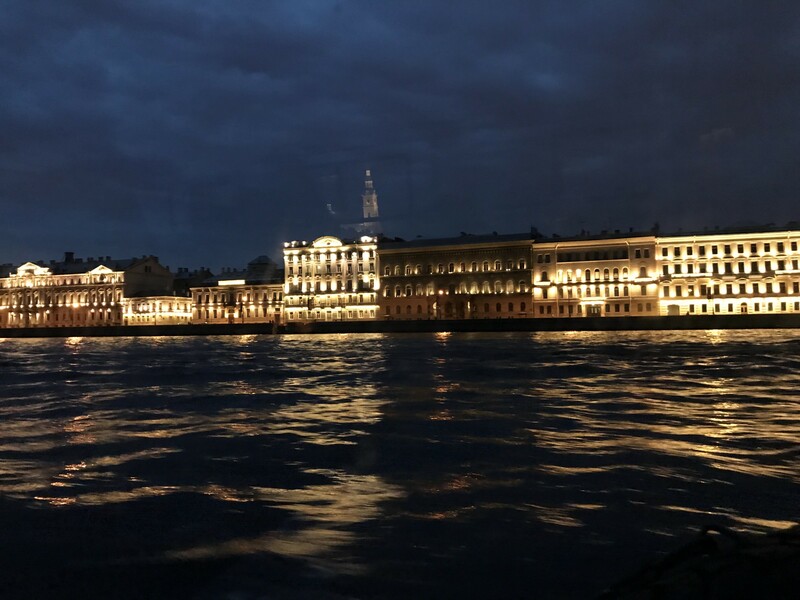 St Petersburg at night, seen from the Neva river. The following morning called for a relaxing few hours at a book store and coffee shop. The snobby baristas—who refused to sell me one of their beautiful mugs—were balanced out with the friendly booksellers, one of whom helped me choose two Russian books that were easy to read. Then it was time to meet Andrey. 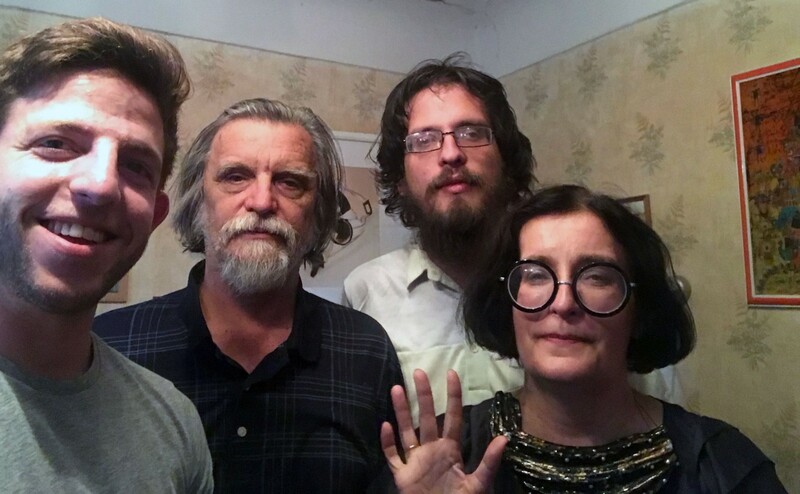 Andrey is a theater director, and he’s learning English to prepare for his upcoming semester of teaching theater in the US. We first met on an online language-learning community, and then arranged a meeting in St Petersburg. For lunch we went to a Georgian restaurant, where Andrey recommended a few dishes and the house wine, told me of his army service in Georgia (part of the USSR at the time), and his thoughts about teaching in the US. 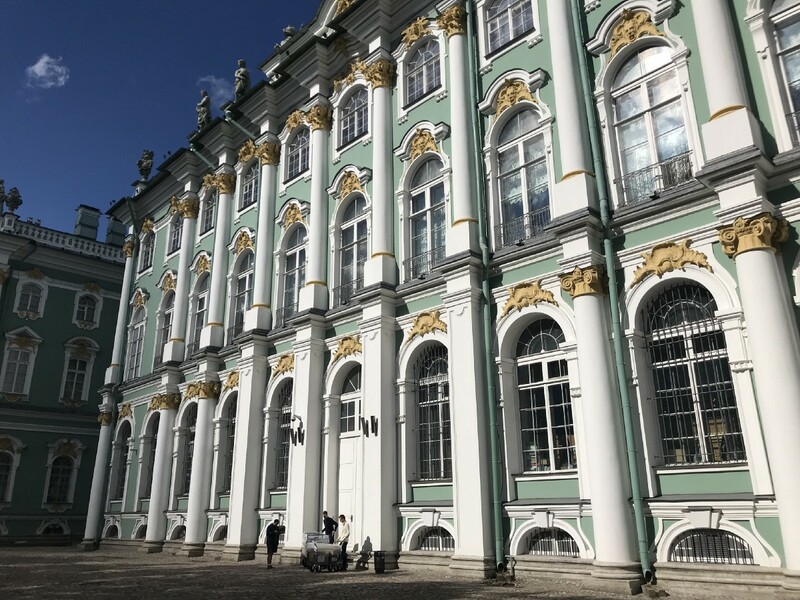 Next, we went to the Hermitage Museum and whirled about as quickly as we could, seeing this room and that, some containing artworks, others just royal furniture, and others—such as Andrey’s favorite Georgian Room—completely bare, with such beautiful interiors that they needed no adornments. There were two famous madonna and child paintings by Leonardo da Vinci. I read about Leonardo da Vinci just weeks before, but failed to remember any interesting facts about these masterpieces, so we examined them in silence. Works by Leonardo da Vinci. One of the many sculpture rooms. We had time for just one more exhibit. There were many options to choose from, but we agreed on the baroque artist Rubens. 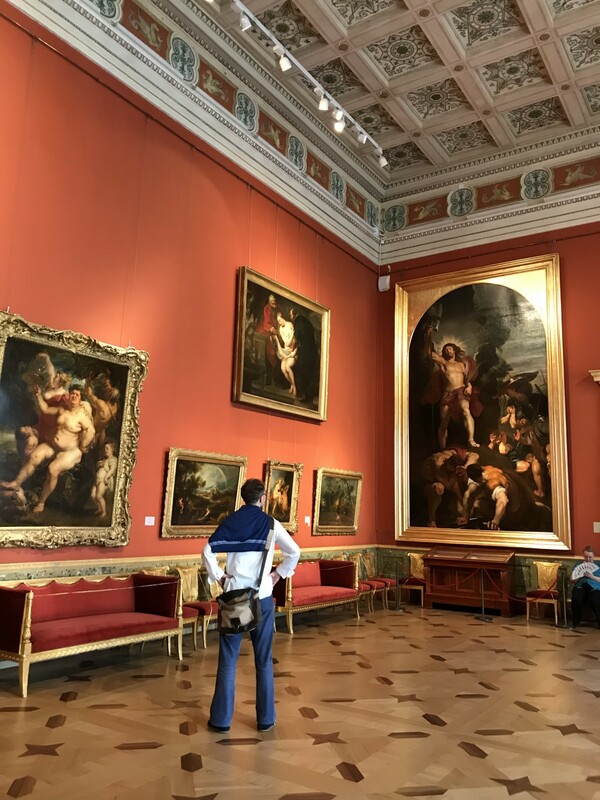 Andrey admires the artwork of Rubens inside The Hermitage Museum. 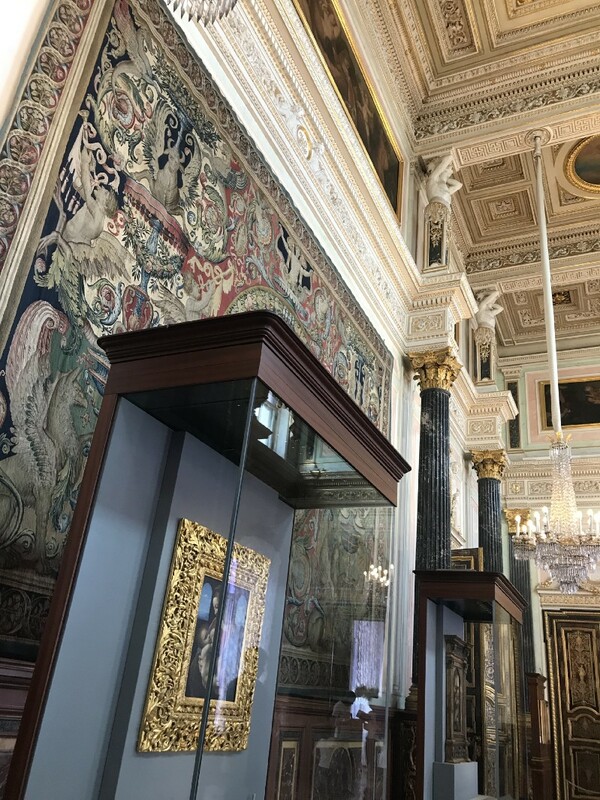 We found the Rubens gallery, marveled at the heavenly work, and rushed out. Andrey helped me find the right bus to head back, and in typical Russian fashion he stayed until the bus arrived and waved goodbye as it pulled away. The day before, Vlada invited me to a hat show. I don’t know much about fashion, or hats, but when you’re invited to a hat show in Russia, you go. I put on my finest available outfit—gray jeans and blue t-shirt—and went. The smokey lounge hosting the hat show. One of several hat models. Vlada stood from her Super-VIP table, either glad or surprised I showed up, and sat me at a VIP table with her name on it. She promised to seat others with me and excused herself for having to return to the Super-VIP table—probably to debate and direct the future of Russian hat fashion. My table was in the perfect geometric center of the lounge, and it looked very lonely with just me. I ordered a Negroni and assumed my best “I belong here” posture. 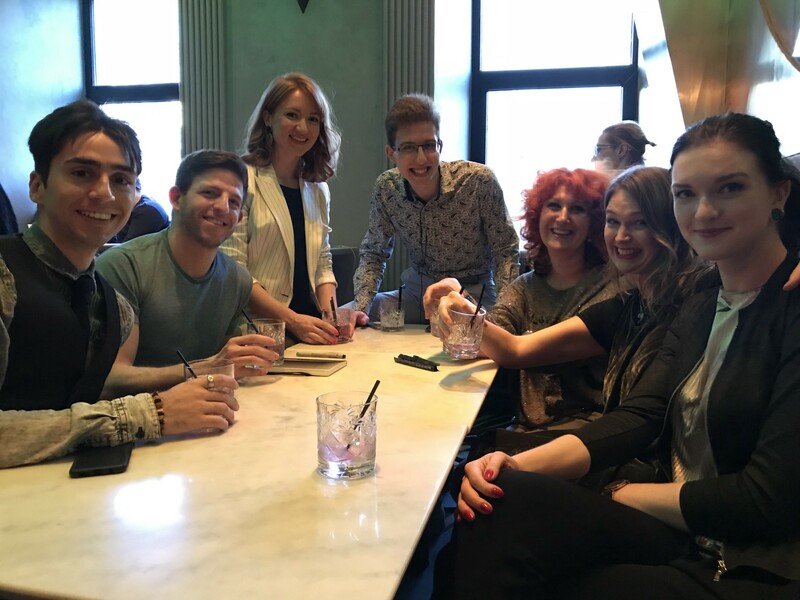 As the lounge filled up over the next half-hour, Vlada kept her promise and sat more friends and colleagues at the table. She introduced each arrival with the flourish of a socialite at the top of her game, then sprung back to her Super-VIP table—probably to settle the hat question once and for all. A woman with dyed red hair was Vlada’s colleague, also a professor of fashion design. To her right was a friend, whose name and occupation I didn’t catch; she had the looks and sass of an early 30-something but I later learned she has a grown son - people marry and have children earlier in Russia than they do in the US. 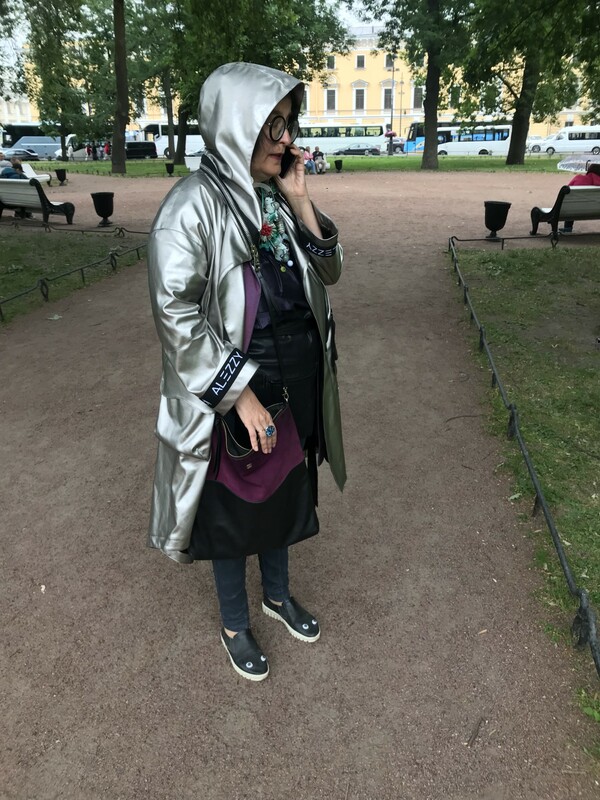 Snezhana is an up-and-coming fashion designer who studied in the US and now has her own company that fuses tech with fashion. Albert interned for Snezhana and is working to become a fashion designer or an actor. Serge (whose real name I forgot) was preparing to apply for business schools in Canada and asked me what I thought of Toronto. Olesya wants to leave her banking job to become a stylist, and came to network. Natasha (whose real name I forgot) helps Russians apply to London fashion schools. After the show we—we were a “we” by then—were invited by Vlada to the afterparty, where the conversations continued. The hat-show afterparty. Albert, me, and Olesya on the left, Snezhana on the right. Some hours later the alarm on my phone signaled it was time to go. I didn’t want to leave but there was an overnight train to Moscow to catch, and 6,176 miles of railroad ahead of me. I said goodbye, wished everyone luck in their fashion endeavors, and made my exit.